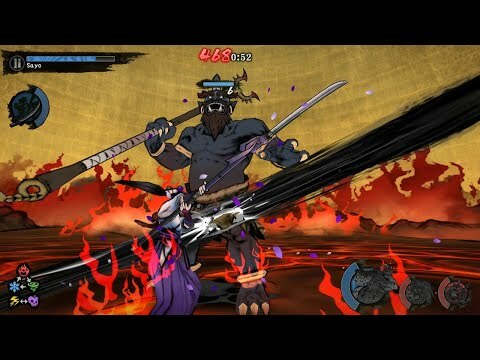 Today I will show you a really great game called World of Demons published by DeNA. This game has the traditional Japanese stylings of Okami and the studio’s trademark spin on classy combat, but World of Demons is designed purely for your iPhone and – of course – all the microtransactions that come with it. Platinum Games has teamed up with DeNA (the company that worked with Nintendo on Super Mario Run and Animal Crossing: Pocket Camp) for the project, and the game will be released into the App Store in the summer. It’s all about slicing and dicing monsters with your sword – all inspired by traditional Japanese mythology – and collecting minions (not the small, yellow, giggling kind) that can help you in battle with stuff like elemental buffs and attack spells. It looks very slick and pretty on the small screen, and DeNA’s Andrew Szymanski says that serious effort has been put into making it feel good for your fingers too. And now let`s get to the gameplay review. As Fruit Ninja proved, swords and swiping go well together, so the controls and camera have been designed for maximum speed, minimum finger strain. “We’re pretty confident we’ve got a great expression of this style of action game on a touchscreen,” says Szymanski. If the free-to-play side of things is a red flag for you, Szymanski is here to try and assuage your fears. Basically, you can spend either time or money, and you’ll end up with the same rewards at the end. One important thing is that we haven’t locked anything behind a purchase, so anything can be obtained through normal gameplay,” says Szymanski. “We’re really trying to provide a lot of different options for different types of players.” Some of these options are the usual paying for buffs and cosmetic options, but there’s also the ‘Beckoning Cat System’ where you can pay to permanently increase your drop rate for minions. I think that this game is a little bit one-sided. I think that this game is great.